Oil prices might be down, but we refuse to boot these oil stocks out of our portfolio. With the year drawing to a close, its a good time to take a closer peek at your portfolio to see if there are any losers that need to be let loose. The odds are pretty good that anything related to oil would fall into that category and be a candidate from some tax-loss selling. However, despite the temptation to sell, either for the tax loss or just to get a loser off the books, there are some stocks we refuse to part with because we firmly believe in their long-term potential. Here are three oil stocks that we refuse to sell. It has a diverse asset base filled with low-cost, low-decline sources of oil and gas. It has a fortress-like balance sheet with A-rated credit. It pays a robust dividend, which remains the company's top priority. ConocoPhillips' diverse asset base, which includes conventional onshore and offshore assets, LNG, oil sands, and unconventional shale plays, really provides broad exposure to the industry. Furthermore, that diversification gives the company a lot of flexibility to invest in its best returns projects. Meanwhile, the strong balance sheet enables the company to continue to invest in its business during the tighter times, such as the current downturn. It's really that overall combination of diversification, flexibility and financial strength that puts the company in a strong position to weather any downturn in the market, which is what investors want in a core holding. Then there's the dividend, which has always been above average because the company believes a strong dividend makes it more disciplined. That means the company won't chase growth for the sake of growth, because it needs to generate strong margins and cash flow to maintain its dividend. Furthermore, the dividend also forces the company to keep a strong balance sheet so it has the flexibility it needs when times get tough. And the dividend provides a tangible return during the good times and bad. My decision to keep holding ConocoPhillips really boils down to the fact that it is built to last. That's why I refuse to part with it during tough times, because I know I'll be rewarded when conditions eventually improve. To say you'll never sell something seems like a very emotional decision that might lead you astray when the conditions change. So, I'm going to include a qualifier here. Unless we see a radical change in the oil and gas market -- I mean, a double-digit-percentage drop in demand kind of radical change -- then I'm probably never going to sell my shares of Core Laboratories (NYSE:CLB). The company is essential to oil and gas producers improving well economics. The products and services Core Labs offers give producers more barrels per investing buck. No matter what part of the cycle the oil industry is in, employing Core is in the best interest of producers. This gives Core Labs something very few oil services companies have: pricing power. Over the past year, most oil services companies have seen their EBITDA margins decline precipitously, but Core has been able to maintain EBITDA margins in excess of 20%, and the best returns on invested capital in the industry. Image source: Core Laboratories investor presentation. Core uses these business strengths to return tons of excess cash to shareholders. In the past 14 years, the company has repurchased more than 37% of its shares outstanding, all while paying a modest dividend. Sure, the day will come when the oil and gas industry will see some radical changes outside the typical ups and downs of a cyclical market, but until it does, I'm hanging on to my shares of Core Laboratories. It may seem like Ultra Petroleum (NASDAQ:UPL) is an ideal sell candidate rather than a stock to hold, and for some investors, that may be the right call. Shares of the small, independent natural gas and oil producer are down nearly 90% from their 2015 peak, and oil and natural gas prices are in the dumps. So, why am I refusing to sell? Ultra Petroleum is one of the lowest-cost natural gas producers in the country, with a cash cost of less than $2 per MCF. 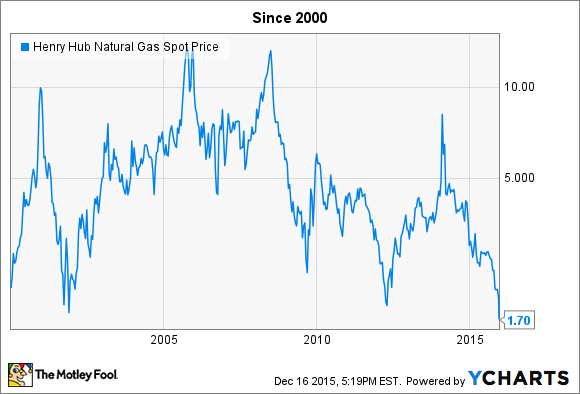 Yes, Henry Hub natural gas futures fell below $1.90 recently -- the lowest price in over a decade -- but Ultra is strong enough to ride out the current gas turndown. Besides its low-cost drilling operations, Ultra's hedging activity helped it to realize $3.33 per MCF in the third quarter, versus an average unhedged price of $2.68 per MCF. Ultra's hedges -- as far as what is publicly available -- may not take up as much slack in the fourth quarter, but gas prices should recover relatively quickly, if history is any guide. Lastly, Ultra's Pinedale acquisition continues to pay off as one of the cheapest, most efficient gas plays in the U.S. The company has reduced its costs in this play more than 25% from last year, and 8% since last quarter already, and it expects to continue reducing costs and well times. So, while all things oil and gas are taking an end-of-year beating, I'm not panicking, nor selling. As a matter of fact, I'm more likely to be buying Ultra Petroleum in this environment than I am to sell.